In February 2012, I released Tetrizm, a Tetris game for the Casio Prizm. It offered five exciting Tetris modes, Marathon, High Speed, Touchdown, Sadistic, and Cascade. It ended up being a fairly popular Casio Prizm game, so when the TI-84 Plus C Silver Edition arrived in 2013, I quickly ported it to the new calculator. Tetric A brought Tetrizm's gameplay almost precisely intact to the TI-84 Plus C Silver Edition, and now, I'm happy to announce that I've ported Tetric A to the TI-84 Plus CE. 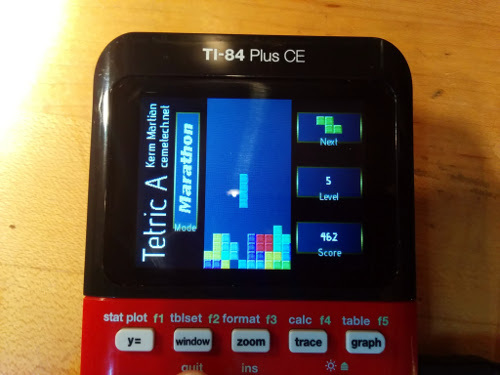 Tetric A for the TI-84 Plus CE offers everything you'd expect from Tetric A/Tetrizm, including five fast-paced Tetris modes and high scores for each mode. Because there's no Doors CSE for the TI-84 Plus CE yet, you'll have to run prgmTETRIS with the Asm() token, but to make that easier, it includes a TI-BASIC prgmATETRIS that does that for people. I hope you'll give Tetric A a try on your calculator, and I'd love to hear any thoughts, feedback, and if you find any, bug reports. Congrats on getting this ported, Kerm! It looks great and smooth, makes me jealous that BASIC can't be -that- good for obvious reasons. Another file I'll need to drop on my CE soon! Oh, I totally thought that was a Caps Lock mistake. Thanks for pointing that out to the slow ones among us. Thank you! I'm sufficiently happy how it turned out myself. Woohooo! Now I have a reason to buy one! On a side note, the "lightning" variant of this model looks delicious! 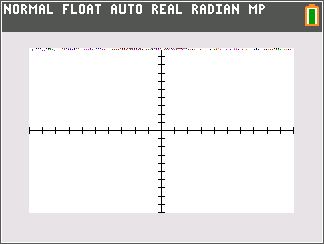 Kerm, clear out the graph buffers, or mark the graph screen as dirty. Haha, it's the random datas! *bump* Kerm, did you fix ^^that^^ yet? I did, and I just uploaded fixed versions to Cemetech and ticalc.org. Thanks for the bug report! "bump" I play this a LOT on my CE, and when I do Cascade mode, I notice that sometimes, when the blocks fall and form a line, it won't do it until the next block has dropped. Thanks for the bug report, and I'll see if I can replicate your bug. I've had this bug too, but it doesn't bother me much. I don't want to ask for too many new features... but it would be really awesome to be able to save just one game and exit so I don't have to leave it running while paused before resuming my game.